It’s Labor Day weekend which brings lots of visitors to our area for the long weekend. Some return to our area for relaxation and fun and others are new. Many visitors fall in love with SW Florida and get the itch to buy. Here are 5 things a buyer should know about our current market. 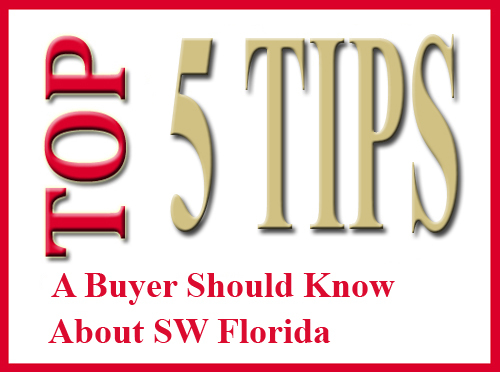 5 Things a Buyer Should Know About Lee County Real Estate. 1. SW Florida is a Desirable Place to Live and Work: In fact large companies like Hertz and Alta Resources are moving their headquarters to SW Florida because it’s an easy sell to employees or future employees. Not every employee can or will relocate, so companies have to ask is the destination attractive to future employees. Invariably the answer is Yes to our area. 2. Prices Have Risen From Their Undervalued Lows: Back in 2008-2009 SW Florida was littered with foreclosures due to the excess of the mid 2000’s SW Florida was overbuilt and the flipping frenzy ran out. Buyers contact us today hoping to buy at 2008 prices. Some still believe our market has not changed in last 4-5 years and they can buy at those undervalued prices. That’s just not true. 3. Listing Inventory is Down: Inventory has been falling. January single family home inventory stood at 6,215. Today it’s down to 4,924 and has been falling every month. It’s common to receive multiple offers on a property if it’s priced correctly. Buyers are surprised there may only be 1-4 homes that match their criteria on the market. 4. Interest Rates Are Rising: We saw a big jump back in May, over 1% jump in about 5 weeks. Every 1% jump takes away 9% buyers purchasing power. That rate swing back in May means a buyer that could afford a $200,000 mortgage before the increase could only afford a $180,000 mortgage after the swing. Buyer’s purchasing power is going down, and this wouldn’t be the end of the world if prices were falling, but see Point #2. Prices are rising, not falling. To make matters worse, we expect rates to go up even further. The Feds have been keeping rates down with stimulus by buying. The Fed has indicated they will scale back buying treasuries at some point and this has caused the bond market to react. We know it’s coming, and some speculate it could happen as early as this September. When it happens, rates will eventually go up. If you’re on the fence, waiting to buy will absolutely cost you, even if prices stayed the same. 5. Educate Yourself on the Market: It does no good to read articles from 3 years ago on what was going on in the market. It also does no good to read about one market in the country and expect everywhere you visit conditions are the same. If you’re new to the area, or even if you’ve lived here awhile, it pays to get the latest data and analysis. When we go out to a home to do a CMA (Comparative Market Analysis) we have to update ourselves with the latest information. Even if we sold 15 homes in that subdivision last year it doesn’t help figure out today’s prices. We arm ourselves with data on each listing appointment. Why wouldn’t a buyer want the same information when purchasing? Feel free to visit Topagent.com You’ll have access to our Future of Real Estate Show where we update you on the market via video and explain the latest charts and graphs. Or you can read our Blog at http;//blog.topagent.com Feel free to search the MLS like an agent at Topagent.com, or visit our virtual tours. If you need help or would like to talk to a professional, we’re here to help 239-489-4042 Good luck and Happy Buying/Selling!!! Posted in Cape Coral, Cape Coral Real Estate, Fort Myers, Fort Myers Real Estate, Southwest Florida Real Estate.Tagged 5 Things a Buyer Should Know About Lee County Real Estate, Future of Real Estate Show, Lee County Florida real estate, Southwest Florida Real Estate, SW Florida.